Miles Davis, one of the most influential jazz musicians of his time period, changed the course of jazz four times during his career and gave the trumpet a more melodic sound that sometimes sounded like a human voice. Eugene Redmond, the poet laureate of East St. Louis, explains how Davis' success stemmed from his life in East St. Louis in his poem "So What" (? )…It's "All Blues" Anyway: An Anecdotal/ Jazzological Tour of Milesville." Redmond believes that Miles Davis' unique style of music and success in jazz stems from his experiences growing up in East St. Louis; a person has to understand the past and present of East St. Louis to understand Miles Davis. The city, during the 1930's through the 1960's, harbored diverse groups of people and music, and went through social changes which influenced Davis' music. 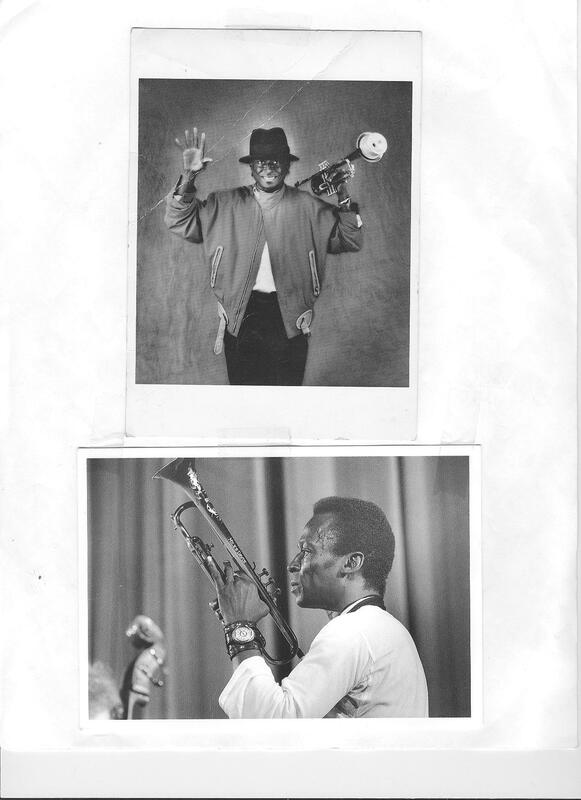 Miles also found in East St. Louis a great mentor in Elwood Buchanan and an idol in Clark Terry, both of whom taught him and encouraged him to develop his unique sound. The cultural diversity where Miles grew let him listen to all kinds of music which he incorporated into his sound throughout his career. Lastly, the strong influence the blues in East St. Louis and St. Louis had on Davis helped him express emotion through his music, which many remember him for. Miles took advantage of the opportunities and diversity East St. Louis provided at the time to produce his own unique sound as a jazz musician. As a young child Davis grew up in the cultural center of East St. Louis at 15th and Broadway which allowed him to listen to a wide variety of music that he would later use in developing his unique style. In his family's small apartment, surrounded by the Ringside pool room, the Jolly Corner lounge, the Peppermint Lounge and Restaurant, and many more clubs, shops, and bars owned by people of various ethnicities, the music playing in the clubs drifted through the streets at night. According to John Szwed in So What: The Life of Miles Davis, "On Friday and Saturday nights, young Miles could sit in his window and hear music of all sorts rising up from the street" (Szwed 8). Redmond mentions the significance of where Davis lived in his youth in his poem "So What" (? )…It's "All Blues" Anyway: An Anecdotal/ Jazzological Tour of Milesville." In the 18th stanza lines 186 - 188, "& clubs (sportsman & peppermint lounges) & Chinese Cuisine/ & professional offices (Dr. Davis's dental art above Daut's Drugstore)/ & a "netword" of "underground"/ "hot traffic"…" (Redmond). Redmond reflects on the importance of living near different lounges and clubs (line 186) which exposed Davis to different kinds of music. The different lounges and clubs made up the "underground"/ "hot traffic" of musicians and nightlife that people came to East St. Louis to enjoy after hours. This exposure to classical, jazz, country, blues, and church music may have given Miles the ability later in life to combine classical, hard rock, and blues with jazz. Growing up in East St. Louis also gave Davis the opportunity to learn from and practice with Elwood Buchanan, who taught Davis and greatly influenced his style. 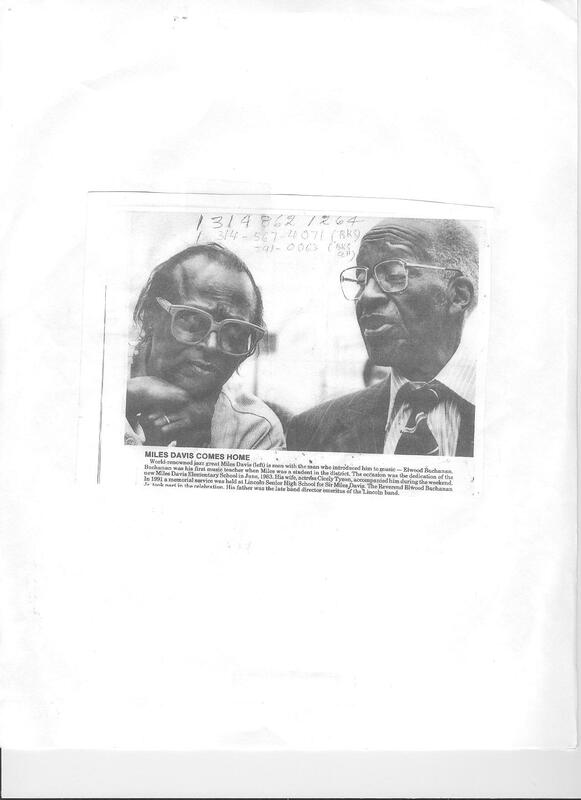 Elwood Buchanan, also a great trumpeter, taught Miles during private lessons every day (Carr 5). Buchanan also taught many great musicians who are listed in stanza 3 of Redmond's poem "So What" (? )…It's "All Blues" Anyway…" which shows how important Buchanan became to the musical development of East St. Louis and to Miles Davis. Buchanan, "was serious about the study of music," and taught his lessons stressing self-control and discipline (Szwed 17). He gave Miles his first structured musical foundation, teaching him how to read music, breath properly, and other technicalities of the trumpet. Buchanan also influenced Davis' whole approach to the trumpet by telling him to play light and fast with no vibrato because, in his opinion, that produced the best sound (Carr 5). From then on Davis played with no vibrato, which helped him develop his unique melodic sound. When Davis played the trumpet it became more vocal in nature, he disguised the brassy sound associated with it, personalizing the instrument (Szwed 21). Clark Terry also influenced Miles Davis and his style by taking him to nightclubs and introducing him to other jazz musicians. While with Terry playing at clubs well into the night, Miles learned how to improvise instead of always reading off of sheets, which gave him more freedom to develop his music (Carr 10). Terry took Davis to highly competitive jam sessions whose level of playing was so high that even "musicians like tenor saxophonist Jimmy Forrest (of "Night Train" fame) dropped by when he was home from touring with the Andy Kirk band" (Szwed 19). These sessions allowed Miles Davis to learn from and try out the techniques of other talented musicians. Terry for instance, influenced Davis to practice from clarinet and piano exercise books to increase his speed and articulation which also helped him develop his style (Szwed 19). Black rights and segregation in East St. Louis also influenced Miles Davis' music. In his poem "So What" (? )…It's "All Blues" Anyway, Redmond describes, in stanza 9 lines 69-71, the racial tension in East St. Louis, before the Civil Rights Movement. "East Saint Fast Slow Paradox…/ of the All American City of race riots & racial harmony & racial estrangement,/ of "conks" & "mobstars" & 3-card mollies & Bloody Island & living room wakes (Redmond). The race riot he refers to in line 70 is most likely the riot of July 2, 1917. The riot stayed alive in the consciousness of white and African American people in East St. Louis for the next three decades, increasing racial tension and segregation (Rudwick 5). Line 72 describes the violence in East St. Louis. Bloody Island, the name of the East St. Louis before it officially became a city, shows that the city always had violent roots. As a child, Miles Davis grew up in the segregated city where people saw African Americans as inferior to whites. That segregation and racial discrimination affected Miles Davis as a child. He always tried his hardest to never let anyone, black or white, push him down or tell him what to do (Carr 6). This mindset enabled him to live the way he wanted to live and to play the trumpet the way he wanted to play, creating his unique style by not feeling obligated to play mainstream or the popular music of the time. He found the freedom to create which helped him give birth to the cool when bebop grew stale (Early). The blues in East St. Louis also had a profound impact on his music. Redmond's Poem "So What" (? )…It's "All Blues" Anyway, has numerous references to the blues in East St. Louis. Even the title of the poem says it's "All Blues." Early writes that, "…few players in jazz or in modern music ever matched Davis's ability to convey deep emotion, a poetic lyricism with an instrument" (Early). Davis used a special mouthpiece and a mute on his trumpet in order to produce the more human melodic sound that he is famous for, which might have been influenced by the blues music he listened to in East St. Louis (Carr 10). Szwed writes that, "…he could signify with a single note, make it sing with the phrasing and the declamatory quality of some blues singers" (Szwed 21). Davis took blues and made it fit his style; he played with emotion and a blues rhythm of his own. Davis learned from East St. Louis, and took advantage of the opportunities he had at the time to become a great musician. If he had grown up anywhere else, he might never have picked up the trumpet at all. The unique opportunities and excellent mentors he found in East St. Louis at the time of social change, combined with his extensive musical knowledge and exposure to many different kinds of music gave him his unique sound. He serves as an example of the great heights hard work, perseverance, and talent can take a person even if they come from a place that others look down upon. He learned how to work hard and survive in the streets of East St. Louis, which helped him become a legendary musician, a musician never afraid to test the boundaries of his music or to create and explore regardless of the criticism. Carr, Ian. Miles Davis: The Definitive Biography. Thunder's Mouth Press, 1999. Early, Gerald. Miles Davis an American culture ed. Missouri: Historical Society Press, 2001. Redmond, Eugene. "So What" (? )…It's "All Blues" Anyway: An Anecdotal/ Jazzological Tour of Milesville." Miles Davis an American Culture ed. Early, Gerald. Missouri: Historical Society Press, 2001. Rudwick, Elliott. "Fifty Years of Race Relations in East St. Louis: The Breaking Down of White Supremacy." American Studies vol. 6 (1965): 3-15.